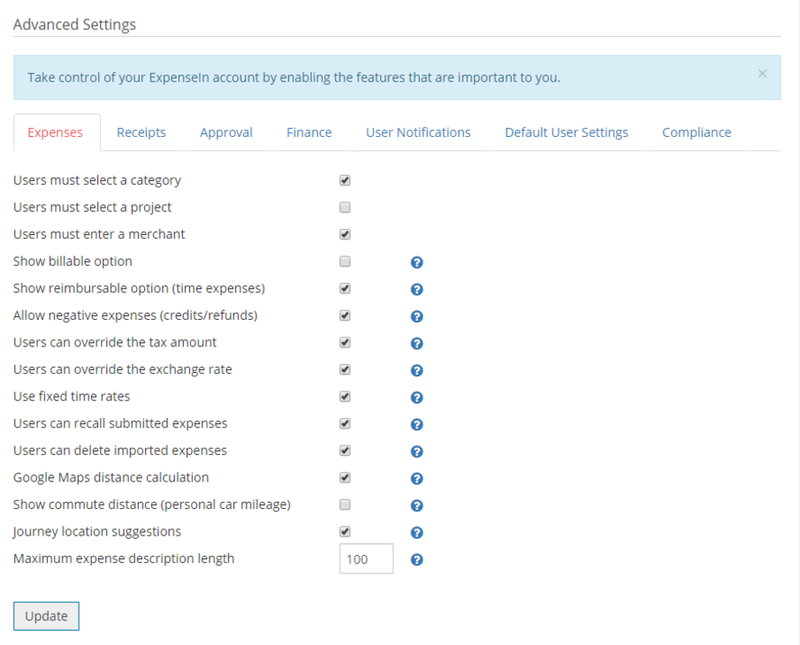 The Expenses tab will allow you to tick any settings that you would like to have present on your account. 2. Navigate to the Receipts tab. Here you can decide which receipt settings you would like to apply. 3. Navigate to the Approval tab. Here you can apply settings that solely affect your Approvers. 4. Navigate to the Finance tab. Here you can apply settings that solely affect your finance team. 5. Navigate to the User Notifications tab. Here you can apply settings that will affect what email notifications your users receive. 6. Navigate to the Default User Settings tab. Here you can apply settings that will affect any future added or imported users. Please note: These settings will not affect current users. If you would like to change your current users' settings, please check out our User article for more information on customising your users' settings. 7. Navigate to Compliance tab. Here you can decide whether your users are able to edit their personal details. If toggled on, this will allow your users to change their name and email address in their My Profile area. Remember to click Update to apply your advanced settings.